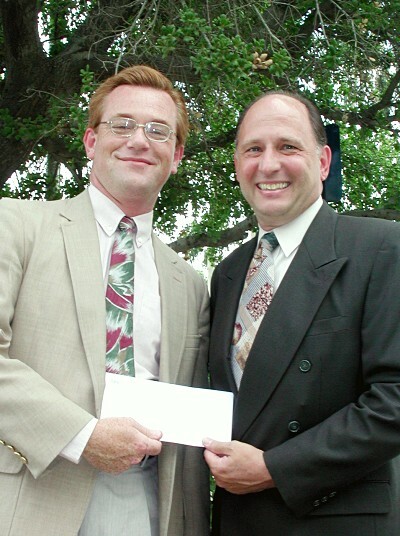 July 11, 2002: Ron Tropcich (right), external affairs director for SBC Pacific Bell, presents a $1,000 check from the Pacific Bell Foundation to SCV Historical Society President Leon Worden. The Society will use the funds to equip its Saugus Train Station headquarters with high-speed DSL Broadband Internet service to run a website kiosk where visitors to Heritage Junction can access the Society's online archives at scvhistory.com. Computer hardware for the kiosk was donated by College of the Canyons, and the project is being overseen by Society volunteer Jeff Boultinghouse.